Store-bought and Restaurant Romaine Lettuce Not Safe to Eat, Again. CDC is advising consumers, restaurants, and retailers not to eat, serve, or sell any romaine lettuce as it investigates an outbreak of E. coli O157:H7 infections linked to romaine. Thirty-two people, including 13 who have been hospitalized, have been infected with the outbreak strain in 11 states, according to the CDC. One of the hospitalized people developed hemolytic uremic syndrome, a potentially life-threatening form of kidney failure. No deaths have been reported. The previous E Coli outbreak May-June 2018 had over 210 cases in 36 states. 96 hospitalizations were reported as well as 5 deaths linked to the May-June 2018 event. When should you plant Bok Choy to have ready in time for Thanksgiving? Now! 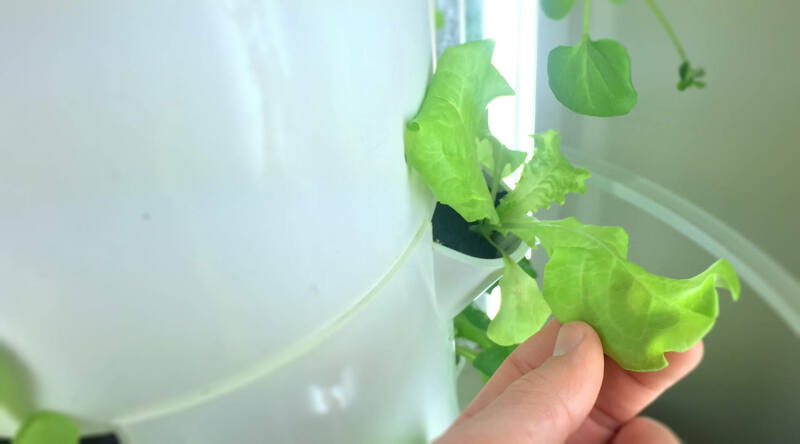 Starting today, October 8th through October 12th is the time to plant Bok Choy in your indoor Tower Garden (with Tower Garden lights) to use in Thanksgiving meal sides and dishes. You can also plant it outdoors or place in a greenhouse — if putting outdoors, be sure to cover if there are any frost warnings and monitor your water temp keeping the water temperature between 40 to 75 degrees Fahrenheit. To learn more on how to use Bok Choy, visit this page to learn about nutritional benefits and a list of recipes to try. Bok Choy is listed as the sixth most nutrient-dense vegetable on the Aggregate Nutrient Density Index (ANDI). You should eat this! Rainbow Swiss Chard: Better Indoors or Outdoors? My Rainbow Swiss Chard in my outdoor Towers is happy happy happy! Indoor Swiss Chard is going great as well, but definitely not as big as what’s growing outside and they were both transplanted on the same date. Swiss Chard is a nutritional powerhouse — an excellent source of vitamins K, A, and C, as well as a good source of magnesium, potassium, iron, and dietary fiber. Do you understand what your plants are trying to tell you? Just like a newborn baby cries for what he/she needs — a plant will exhibit signs of distress, but they do so silently, communicating with visual cues, such as altered leaf colors and shapes. Just like a new parent, if you learn to read these signs, you’ll be able to catch minor issues before they become big problems, thereby maximizing the productivity of your garden. So here’s a lesson in plant language 101. 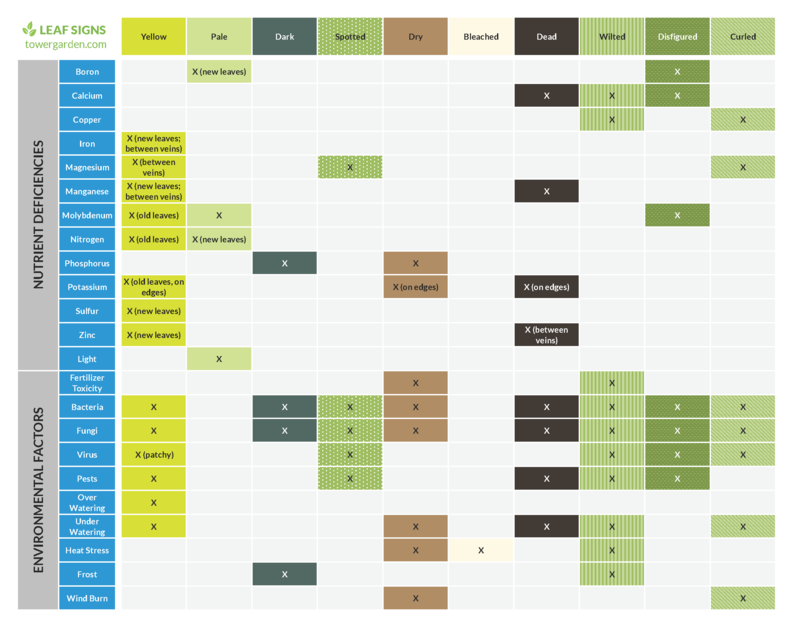 If you notice a problem in your garden use the following chart to help determine what your plants need. If you’re like most gardeners, you’ve faced this befuddling question before. Leaf yellowing — known as “chlorosis” in the world of science — has many potential causes. But one of the most common is undernourishment. For healthy development, plants require 16 different micronutrients and macronutrients. And if they don’t get them or if proportions are imbalanced, leaves may start to look strange, become more susceptible to disease, and slow (or even stop) their growth — decreasing yields. Boron – Young leaves turn light green and may be disfigured. Calcium – Leaves are disfigured and may wilt or show signs of necrosis (i.e., death of plant tissue). Copper – Leaves may be limp and/or curled. Iron – New leaves turn a pale, yellow color between green leaf veins (this is known as interveinal chlorosis). Magnesium – Leaves show spotting and yellowing between green leaf veins. Outer edges of leaves may pucker or curl. Manganese – Younger leaves turn yellow between veins (giving them a net-like look) and may develop dead spots. Molybdenum – Older leaves yellow. Remaining leaves turn light green. All leaves may become distorted and narrow. Nitrogen – Older leaves and veins turn a pale, yellow color. Other leaves turn light green and stay smaller than normal. Phosphorus – Leaves looks stunted and turn dark green or even a deep purple color (almost black for some plants). Leaf tips may look burnt. Potassium – Older, lower leaves show marginal necrosis, even looking scorched around the edges. Leaves also yellow on edges and between veins. Zinc – New leaves yellow and may develop necrosis between veins. For further help with identification, check out this visual representation of deficiency symptoms. The best way to solve deficiencies is to avoid them in the first place by giving your plants the nutrients they need. For soil-based gardeners, that means using fertilizers, rich compost, and other amendments. But if you’re growing with Tower Garden, all you really need is Mineral Blend — a simple, balanced mix of all the key nutrients. Tower Tip: Even if you’re providing the essentials, a high or low pH may keep plants from absorbing or processing them. Most plants access nutrients best when pH is around 6.5. So measure your levels every few weeks and adjust as necessary. Nutrition isn’t the only reason a plant’s leaves may look unusual. Here are a few other common causes. Bacteria – Bacterial diseases can cause wilting and spotting. Fungi – Some leaf fungi mimic certain symptoms of nutrient deficiencies, including yellowing and necrosis. 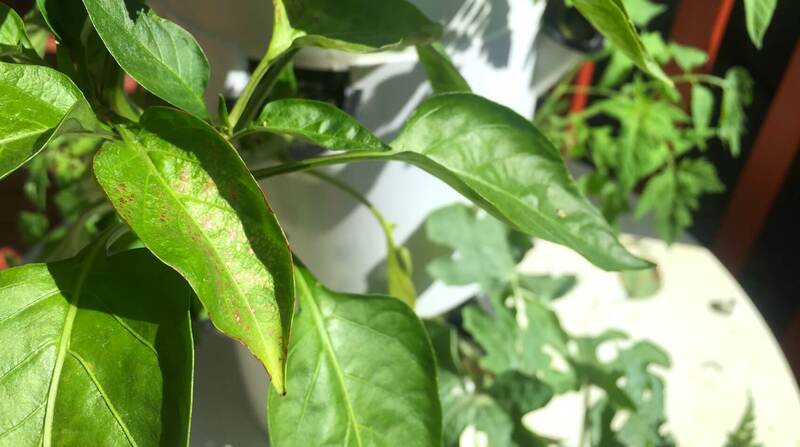 Virus – If you see blotchy or patchy yellowing on your leaves, a virus may be the responsible (especially if the discoloration is accompanied by disfigured growth). One of the most common, non-nutrient-related causes of yellow leaves is over or under watering. It’s a common cause, that is, for soil-grown plants. Check the soil. (I know — it’s basic. But it’s never a bad idea.) If it’s drenched, it may be waterlogged, robbing plant roots of the oxygen they need to survive. In this case, water less. Look for dropped leaves. Plants that don’t receive enough water drop leaves to prevent transpiration (i.e., the evaporation of water from plant leaves). So if you see leaves on the ground, water more. Your growing environment can impact how your plants grow. Here are a few elements to consider. On the other hand, newly transplanted crops may develop bleached spots on their leaves after too much sun exposure. To avoid this, harden seedlings by gradually introducing them to the outdoors over the course of a few weeks. Similarly, when growing inside, leaves that get too close to grow lights may become spotted or scorched due to over-transpiration, which is followed by yellowing, spotting, and, eventually, leaf death. The solution? Harvest more often! To prevent wilting in a Tower Garden full of small seedlings (e.g., plants that are three inches tall or shorter), it’s best to use a half-strength nutrient solution: 10mL of Mineral Blend A + 10mL of Mineral Blend B per gallon of water. You can safely increase nutrients to the full amount once seedlings have grown taller than three inches and developed a robust root structure. This usually takes less than a month. Note: Even for mature plants, overly concentrated nutrients can also cause fertilizer burn. So make sure you’re always feeding your plants the proper amount. Extreme heat often causes plants to wilt. But they usually bounce back once temperatures cool. That being said, these precautions can help protect your plants from hot weather. If you notice black spots on leaves or plants after a cold snap, frost damage is likely the cause. Some plants — particularly kale, collards, and other hardy greens — can survive light frosts. More sensitive crops, such as tomatoes and peppers, however, usually die after freezing weather. If leaves look dry around the edges and/or curl upward, they may be suffering from windburn. Consider setting up a wind barrier to protect them. It’s completely normal for older, more mature leaves of a plant to yellow and die over time (as long as new, green leaves are replacing them). Just remove these old timers as you see them to prevent leaf fungi. What Are Your Plants Saying? Now that you know how to decode your garden’s secret language, diagnosing and rectifying problems should be a little more straightforward. Have any questions or tips of your own? Let’s continue the conversation in the comments below. Want to learn more about growing your own food in a Tower Garden? Click here! CDC, public health and regulatory officials in several states, and the U.S. Food and Drug Administration (FDA) investigated a multistate outbreak of E. coli O157:H7 infections. 210 people infected with the outbreak strain were reported from 36 states. 96 people were hospitalized, including 27 people who developed a type of kidney failure called hemolytic uremic syndrome. 5 deaths were reported from Arkansas, California, Minnesota (2), and New York. CDC laboratory testing identified the outbreak strain of E. coli O157:H7 in canal water samples taken from the Yuma growing region. FDA is continuing to investigate the outbreak to learn more about how the E. coli bacteria could have entered the water and ways this water could have contaminated romaine lettuce. According to the FDA, the last shipments of romaine lettuce from the Yuma growing region were harvested on April 16, 2018, and the harvest season has ended. Contaminated lettuce that made people sick in this outbreak should no longer be available. The Public Health Agency of Canada (PHAC) identified ill people in several Canadian provinces infected with the same DNA fingerprint of E. coli O157:H7. On June 22, 2018, PHAC reported that the outbreak in Canada appears to be over. Consumers should follow these steps to help keep fruits and vegetables safer to eat. Read more on general ways to prevent E. coli infection. Important steps to take are to cook meat thoroughly, and wash hands after using the restroom or changing diapers, before and after preparing or eating food, and after contact with animals. What was the Problem and What was Done? On April 4, 2018 FDA learned about a cluster of E. coliO157:H7 infections in two states and on April 5, 2018 a new cluster was reported in multiple states. In the following weeks, the FDA, CDC, and state partners worked together to collect additional information and conduct traceback activities to identify a food item of interest. On April 10, 2018 the FDA publicly communicated about the outbreak, but was unable to identify a food source. The agency recommended that consumers practice safe food handling and preparation and to consult a health care provider if they think they might have symptoms of E. coli infection. Interviews with ill people allowed health partners to identify chopped romaine from the Yuma growing region as the likely source of contamination on April 13, 2018. April 16, 2018 was the final day of romaine harvesting in the Yuma growing region, however at the time chopped romaine had just been identified as the likely source allowing the traceback investigation to begin and at this point, no specific farms in the Yuma region had been identified. FDA did not receive confirmation of the final harvest date until May 2, 2018. On April 19, 2018, Alaska health partners announced that eight persons with E. coli O157:H7 infections from a correctional facility have been confirmed as part of the outbreak. These individuals ate whole-head romaine lettuce from the Yuma growing region. Following this announcement, the FDA advised consumers to avoid all romaine lettuce from the Yuma growing region. This region generally supplies romaine lettuce to the U.S. during November-March each year. In the following weeks FDA continued its traceback investigation, part of which was able to trace the Alaskan correctional facility back to a single farm, which was released on April 27, 2018. On May 2, 2018 the FDA received confirmation from the Arizona Leafy Greens Marketing Agreement that romaine lettuce was no longer being produced and distributed from the Yuma growing region, reducing the potential for exposure to contaminated product. At that time, due to the 21-day shelf life, we could not be certain that romaine lettuce from that region was no longer in the supply chain. On May 31, 2018 the FDA released a blog with updated information on our ongoing traceback investigation (for additional information, visit FDA Update on Traceback Related to the E. coli O157:H7 Outbreak Linked to Romaine Lettuce). The FDA is working closely with federal, state, and local partners on an ongoing traceback investigation to determine the source of romaine lettuce supplied to ill consumers. In a typical traceback effort, CDC and the FDA identify clusters of people who became ill, especially in different geographical regions and work to trace the food eaten by those made ill to a common source. For this outbreak investigation, we have been able to identify romaine lettuce as the common food source. Romaine products that would have caused illness were no longer available at exposure locations, making it difficult to determine production lots of concern. In addition, we have found that a single production lot may contain romaine from multiple ranches, which makes the traceback more challenging. We are working with federal and state partners and companies as quickly as possible to collect, review and analyze hundreds of records in an attempt to traceback the source of the contaminated romaine lettuce. To date, the available information indicates that romaine lettuce from the Yuma growing region is the source of the current outbreak of E. coli O157:H7 infections, and was supplied to restaurants and retailers through multiple processors, grower/shipper companies, and farms. The information we have collected indicates that the illnesses associated with this outbreak cannot be explained by a single grower, harvester, processor, or distributor. While traceback continues, FDA will focus on trying to identify factors that contributed to contamination of romaine across multiple supply chains. The agency is examining all possibilities, including that contamination may have occurred at any point along the growing, harvesting, packaging, and distribution chain before reaching consumers. (for additional information, visit FDA Update on Traceback Related to the E. coli O157:H7 Outbreak Linked to Romaine Lettuce). The traceback investigation is ongoing and additional information will be provided as it becomes available. From June 4 – June 8, 2018 sampling for the environmental assessment was conducted in the Yuma growing region. On June 28, 2018 the CDC announced that the outbreak has ended. In addition, the FDA and CDC announced preliminary sample results from the environmental assessment of the Yuma growing region. E.coli O157:H7 is a Shiga-toxin-producing (STEC) E. coli. The symptoms of STEC infections vary for each person but often include severe stomach cramps and bloody diarrhea. If there is fever, it is usually not very high (less than 101 degrees Fahrenheit/less than 38.5 degrees Celsius). Most people get better within 5–7 days. Some infections are very mild, but others are severe or even life-threatening. • Cut leafy greens, including romaine lettuce, require time/temperature control for safety and should be refrigerated at 41°F or lower. It’s Thursday night. Five days ago, my husband had a heart attack. I’m starting to decompress and unpack mentally and emotionally the events that have unfolded these last few days. It’s still hard to believe it happened because he is so young (only 45) by their standards and doesn’t smoke. He had a 99% blockage on the right side of his heart and by the grace of God, we were able to get him to the hospital on time to stop the damage and get him the help he needed to live. He’s now on seven new meds with two of those being insulin shots—6 shots he must take four times a day. I look at him today, sitting there in the chair trying to stay quiet and rest (very hard for him) and I’m so thankful to have him with me still and thanking the Lord for his goodness towards me and my five children when things could have gone so very differently. The cardiologists say it’s caused by genetics. He has Type 1 Diabetes and is predisposed to heart disease. My heart feels heavy to hear such hard news. In the last 48-hours especially I have tried to think of how I can incorporate better nutrition into his care. I’m so thankful I’m not starting from scratch and just now starting to make healthy decisions. For several years now, I have been studying and tasting recipes that work to heal the body — not harm. I’ve been growing my own food and experimenting with different methods of growing vegetables. My Mom was the one who actually reminded me of this. She reminded me that I’m not starting from scratch but I’m ready to tackle this challenge head on. I started this blog almost a year ago, but never really did much with it. Maybe that will change now. I feel compelled to share our journey. My hope is that someone will see it and start making changes so that they don’t have to walk thru this. Maybe it will connect with someone who has been recklessly eating out at fast food places. Maybe it will be someone who never had any training on how to grow food yet wants to learn and take a few small steps to better health. Maybe it’s someone like you who needs support in their journey towards health. So, this space — this blog — will be a place where I can share ideas of what we’ve been doing, to teach you something you may not already know about growing nutritious food to put in your body, and overall how you can change and grow your health gardening.